The proliferation of reeds overgrow the fertile land dry and zavolakivaya streams and lakes. To fight with a cane is difficult, but necessary. For the active struggle suitable chemical and physical methods of destruction. Chemical method involves the use of herbicides for dicotyledonous weeds, in particular means "roundup". This tool is applicable both on land and in coastal areas. For use of the herbicide in the zones of bodies of water, dilute 200 g of "Roundup" in 7 l of water and spraying to the leaves of reeds remained dew. Use "roundup" on the garden can be provided that the cane is already out of the ground. Roundup affects the top part of the plant, allows it to develop and multiply. To chemical methods of combating cane belongs and its destruction by fire. The area occupied by the plant, poured gasoline and ignited. However, she needs to burn at least one hour, because the cane has long branched roots. And the fire situation in recent years, the middle lane allows not to resort to such a drastic method, although it is quite effective. To the physical methods of destruction of reed applies his mowing. After all, reed develops and multiplies on top of the soil. Therefore, an effective way to combat it is the mowing of reeds in early spring, with the appearance of its leaves, and autumn with their re-emergence. Another method of dealing with the reeds in the garden plots is draining and the deoxidation of the soil, since the reeds at ease in moist and acidic soil. To do this, dig a drainage ditch along the entire section, the cane is selected manually from the soil together with the root, and the land is not watered for a long time and processed in the alkali-lime mortar. To destroy the reeds in the pond, it also mow in the spring and fall 10 cm below the water level. Water enters the stem of a cane, and he's rotting on the vine. The downside of this method is the clogging of the coastal territory of the remnants of reeds, which is inconvenient for swimming or fishing. If the pond is large enough for cleaning, use hydraulic dredges, which dilute the root system of the reeds to a depth of 30-50cm and remove the weed from the bottom with muddy sediments. Therefore, the pond deepened, cleaned the springs, brushes its ecosystem. Reed is a coastal plant of the family Cyperaceae. Do not confuse it with the cattail. The reeds on the tops of the twigs, and cattail dark brown ears. Previously, reed was considered quite useful. From its rhizomes did flour, because they have a lot of starch. Today the cane is used except for decorative purposes. Of reed leaf weave bags, baskets, mats. Some proponents of ecological methods of construction add the cane in the concrete, getting eco-friendly building material camerabutton. However, this does not solve the problem of getting rid of the reeds in the coastal zone of ponds and garden plots, as consumption in the above-described needs are small, and the cane grows quickly and reproduces annually. 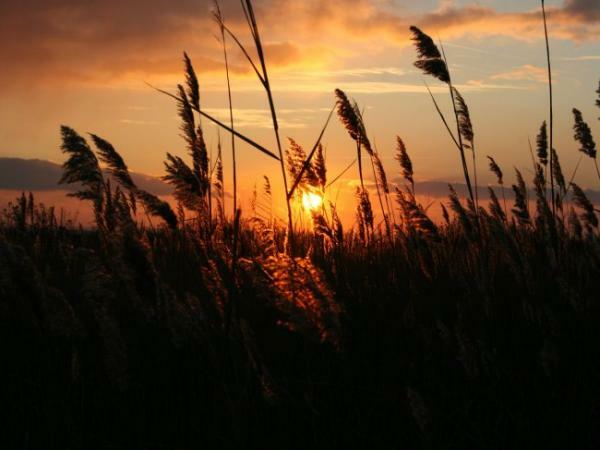 On the territory of our country, there are twenty-five kinds of reeds. The most famous of them is the forest and lake. 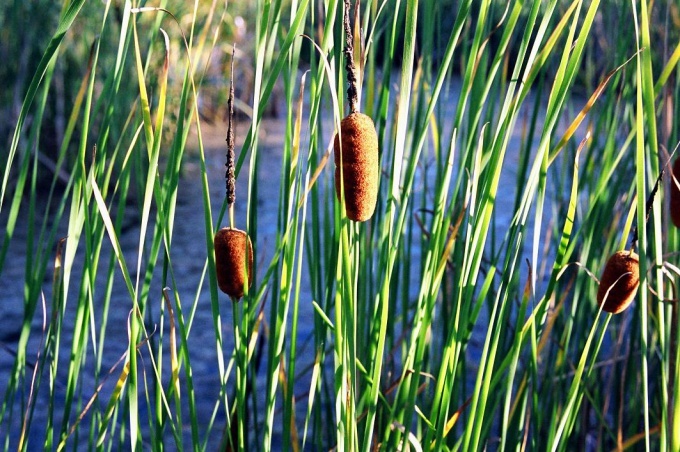 Forest cane grows in meadows, loves the shores of ponds, swamps and moist forests. Lake reed prefers rivers and lakes. It spreads rapidly and covers vast areas of water bodies. If your country site grows the reeds, it says that the land in this area is not mastered. The first step is to drain the territory. Flush that through the dug-up ditch into the Creek, or the nearby lowlands. If the site itself is in a hollow, and even worse, bowl-shaped pit, then pull the water simply is not possible. Dig on the site of a ditch around the perimeter, and the center fill with soil. So you lift the plot. You can create a pond that will be used for fish farming. The soil from this pond may also be the basis for lifting the plot and contribute to drainage on the site. If your garden obicajen for many years and has already served you faithfully, and reed still on it settles, it means that the earth at the site saturated with moisture. You can close the area with a thick plastic film and covered with soil so that no oxygen. After a few days the cane will die. After that, dig it with roots and discard. You need to know that the seeds of the reeds the wind carries with boundaries on the next located areas. Bevel reed before he ossements. The rhizomes of this plant can be put in a compost pit where they will eventually rot. If nowhere else on the neighboring areas the cane is not growing, then your problem is solved. If somewhere close growing cane, we can not waste all this time, the wind will still bring you new seeds. A good way to destroy various weeds in the garden is a pile of manure located in the garden throughout the summer. There are special tools to deal with such uninvited guests in the garden. Spray or pour these funds cane, and its ruin will be complete, from root to tip. It is very important to observe the correct proportions to use such funds. And in any case it is impossible that such a remedy got on the other, the right culture.